1. Joint Department of Biomedical Engineering, University of North Carolina at Chapel Hill and North Carolina State University, Raleigh, NC 27695, USA. 2. Division of Pharmacoengineering and Molecular Pharmaceutics and Center for Nanotechnology in Drug Delivery, Eshelman School of Pharmacy, University of North Carolina at Chapel Hill, Chapel Hill, NC 27599, USA. 3. Department of Medicine, University of North Carolina at Chapel Hill, Chapel Hill, NC 27599, USA. The immune system protects the body against a wide range of infectious diseases and cancer by leveraging the efficiency of immune cells and lymphoid organs. Over the past decade, immune cell/organ therapies based on the manipulation, infusion, and implantation of autologous or allogeneic immune cells/organs into patients have been widely tested and have made great progress in clinical applications. Despite these advances, therapy with natural immune cells or lymphoid organs is relatively expensive and time-consuming. Alternatively, biomimetic materials and strategies have been applied to develop artificial immune cells and lymphoid organs, which have attracted considerable attentions. In this review, we survey the latest studies on engineering biomimetic materials for immunotherapy, focusing on the perspectives of bioengineering artificial antigen presenting cells and lymphoid organs. The opportunities and challenges of this field are also discussed. The immune system is made up of lymphoid organs (such as the thymus, bone marrow, spleen, and lymph nodes), specialized cells (such as T cells and B cells), and secreted proteins (such as cytokines). This network collaborates to protect the body against many diseases. However, immune surveillance can be evaded by a variety of mechanisms. [2-5] For example, cancer cells can produce a variety of ligands, such as programmed death ligand 1 (PD-L1) to inhibit T cell attacking, resulting in PD-L1-mediated T cell apoptosis. [6, 7] Immunotherapy aims to re-boost effective immune responses to destroy harmful cells[8-12] or to protect normal tissues from immune attack in autoimmune disease and rejection of transplanted organs. [11-14] Among them, immunotherapy based on the manipulation and transfusion of engineered immune cells or tissues has recently made great progresses in clinical applications. [15, 16] However, therapy with natural immune cells or lymphoid organs is often costly, time-consuming, and may have a limited effectiveness in clinical trials. [17, 18] The development of artificial immune cells and artificial lymphoid organs using biomimetic strategies has become an emerging field as an alternative. [19-21] Bioengineering technologies, especially immune engineering technologies leveraging biomaterials, such as micro- or nanoparticles and scaffolds, have attracted tremendous attentions. [22-34] Among them, artificial biomimetic materials, inspired by nature, have frequently been studied as immunotherapeutics to treat infectious diseases and cancer. [18-20, 35-39] Here we survey the latest studies using biomaterials-incorporated strategies to mimic immune cells, with a focus on artificial antigen presenting cells (aAPCs) and lymphoid organs. Emerging trends and clinical challenges in this field are also discussed. The major interactions between T cells and DCs and the three signals leading to activation and expansion of T cells. Signal 1 is antigen presentation by interaction between the peptide-MHC complex and TCR; Signal 2 is co-stimulation by co-stimulatory molecule interaction. The binding of CD80/CD86 on DCs and CD28 on T cells is one of the co-stimulatory signals. Negative co-stimulatory interactions such as PD-L1/PD-1 and CD80/CTLA-4 are also shown in this figure. 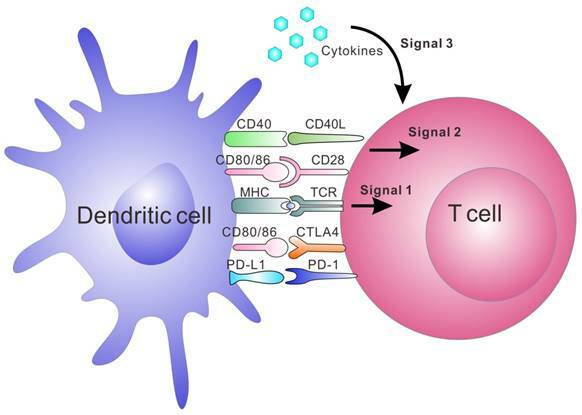 Signal 3 is release of cytokines, which are essential for T cell expansion and differentiation. Artificial APCs (aAPCs) are engineered platforms for T cell activation and expansion that aim to bypass the aforementioned obstacles by mimicking the interaction between DCs and T cells. [20, 35-38, 46] They include multiple systems that utilize engineered cells or synthesized biomaterials. Since these aAPCs are ready-to-use to the patients, this strategy is becoming a common tool in immunology and clinical applications. [47, 48] Synthetic aAPCs based on biomaterials have shown great success in generating anti-tumor immune responses in vitro and in vivo. [20, 36, 37, 44, 49] They are often conjugated or encapsulated with three signals required for T cell activation (Figure 1). Signal 1 is the binding of peptide-MHC complexes to provide T cell receptor (TCR) specificity. TCR agonists, such as recombinant peptide-MHC complexes or antibodies directed towards CD3, lead to ligation of the TCR, which triggers the activation of the T cell. Signal 2 is provided by co-stimulatory molecules, which are upregulated on APCs; this leads to the complete activation of T cell. Co-stimulatory agonists, such as the anti-CD28 monoclonal antibody (mAb), are known to provide the necessary co-stimulatory signals to T cells. Lastly, signal 3 involves cytokines produced by either APCs or T cells, which are essential for T cell expansion and differentiation. [50-53] IL-2 is one of the most known cytokines for CD8+ T cell survival. Other cytokines such as IL-7, IL-15 and IL-21 have been investigated and may promote better expansion or differentiation into more optimal T cell phenotypes. [50-53] In addition to the activation of T cells by aAPC, tolerogenic aAPCs coupling with negative signals, such as apoptosis-inducing molecules, deplete targeted antigen-specific T cells. It is another strategy to treat autoimmune diseases and allograft rejection. [54-56] Here, we summarize recent advances in aAPC systems with an emphasis on synthetic and biomimetic biomaterials for both ex vivo and in vivo applications in immunotherapy. The dynamic lipid bilayer is essential for the molecular interactions in the natural systems. To mimic natural interactions between natural APCs and T cells, lipid bilayer-based particles with a fluid membrane have been developed as aAPCs. [58-62] For instance, MHC-containing liposomes developed by Prakken et al. have been reported to activate CD4+ T cells in vitro, leading to T cell proliferation as well as IL-2 secretion. It indicated the role of the lipid membrane as a scaffold supporting MHC-restricted antigen presentation. In addition, preclustering of MHC-peptide complexes on the APC membrane microdomains enhanced the efficiency of T cell activation. In fact, natural APCs have been shown to precluster antigens even in the absence of T cells. Therefore, Ding et al. designed reconstituted liposomes with membrane microdomains containing enriched epitope/MHC complexes, also known as RAFTsomes, to stimulate CD4+ T cell proliferation. Similarly, Giannoni et al. described an aAPC system for ex vivo stimulation of human polyclonal T cells. The described aAPCs were based on artificial membrane bilayers containing T cell ligands membrane microdomains. They showed that preclustering of MHC molecules triggered a higher degree of T cell activation than soluble tetramers and aAPCs with MHC molecules uniformly distributed in artificial bilayer membranes. In a subsequent study by the same group, anti-LFA-1 (an adhesion molecule to allow for an efficient aAPC-T-cell interaction) together with anti-CD3 and anti-CD28 were preclustered in microdomains as before which resulted in an increased expansion of polyclonal T cells or antigen-specific T cells (lymphocytes from tumor-invaded lymph nodes cultured with the cognate antigen before) compared to commercially available systems (Dynabeads® CD3/CD28 T Cell Expander). To enhance the stability of the liposomes, researchers also used solid particles as a scaffold or core for the lipid bilayer, also called supported lipid bilayers (SLBs). Different SLB systems have been developed recently,[65-68] which offered improved stability to standard liposomal formulations. For example, Ashley et al. developed a protocell that consists of a nanoporous silica core and a SLB, which enabled increased stability and drug loading capacity. The authors found that the nanoporous silica particles showed increased membrane fluidity compared to the protocells formed from nonporous solid silica nanoparticles or unsupported liposomes. In another example, using silica beads coated with a lipid bilayer was shown to be more efficient than liposomes to boost CTL responses. In addition, various types of natural cell membranes were extracted for particle coating. [65, 68, 72-75] For example, plasma membrane of tumor cells vesicles have been coated on poly (lactic-co-glycolic acid) (PLGA) particles, silica microbeads, or latex microbeads for immune stimulation, leading to increased immune activity (Figure 2). This technology presents the potential to synthesize particles that are coated with natural DC membranes for aAPCs preparation. Cancer Cell Membrane-Coated Nanoparticles. (A) Schematic of CCNP synthesis. The cancer cell membrane along with its associated antigens were coated onto PLGA polymeric nanoparticle cores. The resulting CCNPs was used to deliver tumor-associated antigens to antigen presenting cells or to homotypically target the source cancer cells. (B) Transmission electron micrographs (TEM) of cancer cell membrane-coated nanoparticles. Reprinted with permission from ref. . Copyright 2014 American Chemical Society. Various polymers, such as biodegradable PLGA[77-83] and non-biodegradable sepharose or polystyrene beads[84-95], have been incorporated into aAPC systems. Immunomodulatory compounds, such as anti-CD3, pMHC and anti-CD28 mAbs can be anchored on the surface of polymeric particles, while IL-2 or other soluble molecules can be gradually released from within the aAPC. Non-biodegradable sepharose or polystyrene beads were the first synthetic bead-based platforms used to activate T cells. [96, 97] It was reported that the optimal size of microbeads was between 4 to 5 μm, which is one important parameter for T cell activation. The polymer bead-based aAPCs have been used as a tool to study T cell biology. [98, 99] Additionally, aAPC systems can be synthesized from a variety of biodegradable polymers, such as PLGA. Steenblock and Fahmy developed a PLGA-based biodegradable aAPC that presented both recognition ligands and co-stimulatory ligands (anti-CD3, anti-CD28 mAbs and peptide-MHC complexes) on its surface and slowly released the encapsulated cytokines (IL-2) from particles (Figure 3). Surface ligand presentation was stable about 20 days, leading to a significantly secretion of interferon gamma (IFNγ) by the murine and human T cells ex vivo. The PLGA particles of 6-10 μm in size were found to be the most effective for T cell activation and expansion ex vivo. In another study, Kosmides et al. combined an antigen-specific PLGA-based aAPC and a checkpoint blockade molecule, anti-PD-1 monoclonal antibody, for cancer immunotherapy. The PLGA particle was functionalized by antigen specific MHC-I and anti-CD28 mAbs. Combinatorial treatment with aAPCs and anti-PD-1 enhanced CD8+ T cells in vitro, significantly delayed tumor growth in vivo, and increased median survival time in mice after systemic administration. It was associated with reduced PD-1 expression and enhanced antigen-specific proliferation of CD8+ T cells within the tumor microenvironment and spleen. Biodegradable polymeric artificial antigen-presenting cells. (A) Schematic of a biodegradable PLGA aAPC. Anti-CD3, anti-CD28 mAbs, and pMHC complexes were loaded onto aAPCs through biotin-avidin conjugation. Encapsulated cytokines were released from particles in a time-dependent manner. (B) SEM imaging of the microparticle. (C) Fluorescence imaging of aAPC-T-cell binding. (D) Expansion of T cells after various treatment as indicated. Reprinted with permission from ref. . Copyright 2008 American Society of Gene & Cell Therapy. It is known that shape of aAPC appears to be an important factor for T cell activation as the natural APCs are not spherical. [80, 100] Therefore, non-spherical PLGA-based microparticles have been designed to mimic the natural situation by increasing the contact area of particles. The film-stretching method was used for controlling the shape of PLGA microparticles to generate ellipsoidal aAPCs with varying long axis lengths and aspect ratios. 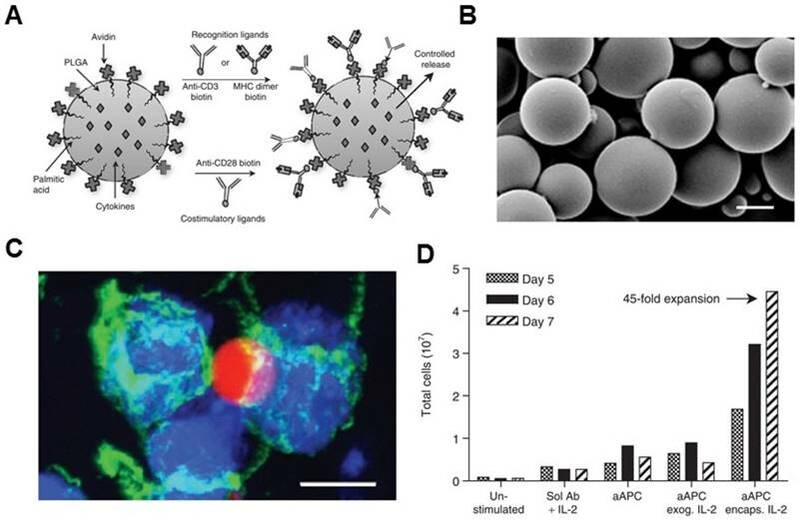 It was reported that elongated PLGA particles with a more ellipsoidal shape were more efficient as aAPCs compared to spherical particles, leading to a higher T cell proliferation in vitro. In a subsequent study by the same group, Meyer et al. synthesized nanoellipsoidal PLGA aAPCs as before and they activated T cells in vivo following systemic administration. After systemic administration, these nanoellipsoidal aAPCs stimulated stronger in vivo immune cell responses comparable to previously reported spherical aAPCs at a reduced overall protein dose. Moreover, the authors found that these nanoellipsoidal aAPCs had enhanced pharmacokinetic properties, properly due to their resistance to hepatic and splenic elimination. In addition to PLGA, a new class of semi-flexible and filamentous polymers comprising of poly (isocyano dipeptide) and oligo (ethylene oxide) side chains were developed by Rowan and coworkers. Anti-CD3 mAbs were decorated to these highly controlled, semi-stiff polymers to mimic dendritic cells. These anti-CD3 polymers induced a more robust T cell response than PLGA microparticles. This enhanced activity can be attributed to the structural flexibility and multivalency of these polymers, assisting in the formation of TCR nanoclusters on the T cell surface. In addition, these semi-flexible and filamentous polymers were biocompatible and non-toxic, highlighting their promise for the induction of both ex vivo and in vivo T cell responses. Synthetic aAPCs may also contain superparamagnetic parts for further separation from cells by the magnetic field before transfusion into patients. Magnetic particles are of particular interest for ex vivo T cell expansion. [86, 104-108] Levine et al. used magnetic beads covalently linked to anti-CD3 and anti-CD28 mAbs to first demonstrate expansion of purified CD4+ T cells in vitro. Today, T cell expansion ex vivo using anti-CD3/anti-CD28-coated magnetic beads has been applied in clinical trials of ACT to treat various types of cancer[109-113]. In addition to magnetic beads, magnetic nano-aAPCs were recently developed. Perica et al. developed a strategy using magnetic nano-aAPCs and an externally applied magnetic field to enhance the T cell receptor clustering. After binding to the TCR, the magnetic field was used to drive aggregation of these magnetic nano-aAPCs, resulting in TCR clustering and increased T cell expansion in vitro and after adoptive transfer in vivo. Magnetic field-enhanced nano-aAPC stimulation is a novel approach to drive receptor clustering. In another example, a magnetic field was used for the enrichment of rare tumor-specific T cells and activate them to induce proliferation. 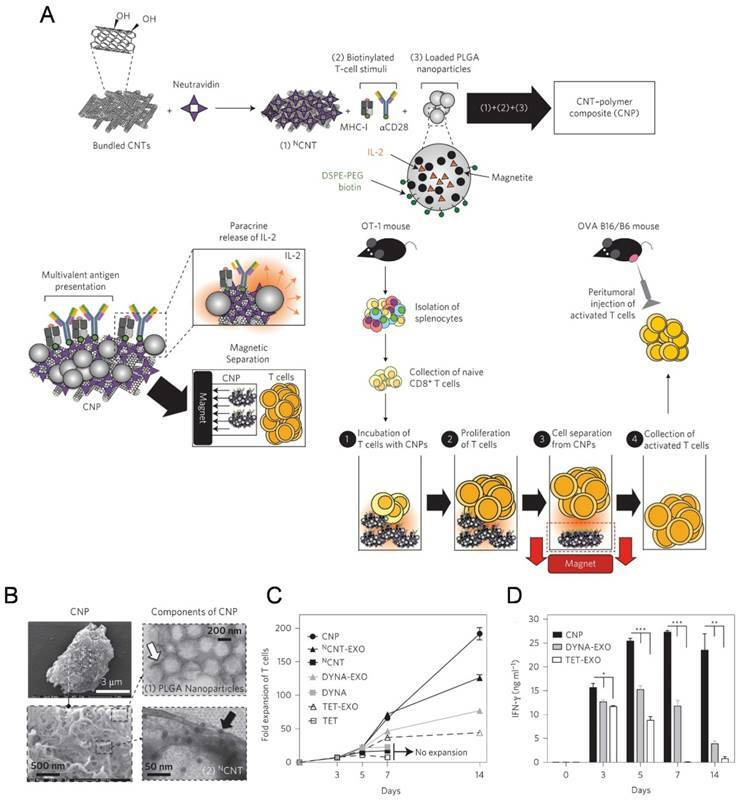 This enrichment and expansion strategy using paramagnetic nano-aAPC could effectively expand tumor-specific T cells, resulting in a greater than 1000-fold expansion of tumor-specific T cells in one week. Janus particles, named in reference to the Roman god, Janus, who had two faces, are particles that have two distinct faces. Double-sided Janus particles could prove useful in the development of aAPCs. Yu and co-workers designed a magnetic Janus microparticle to control T cell activation remotely. One side of these particles was decorated with a thin film of magnetically responsive materials, and on the other side coated with stimulatory ligand (anti CD3) for T cell activation. By simultaneously controlling the rotation and locomotion of the Janus particles, the authors demonstrated the initiation of T cell activation in single-cell precision. The high-surface-area carbon nanotubes have been widely used as in aAPCs for ex vivo T cell expansion[116-119]. Fadel et al. demonstrated that anti-CD3-coated tubes induced a higher specific T cell activation and IL-2 production than other high surface area materials (activated carbon, polystyrene, and C60 nanoparticles). A potential mechanism for the enhanced stimulation response with treated single-walled nanotubes (SWNTs) surface may be due to the local clustering of the antibody stimuli in defect regions combined with the chemical nature of the environment surrounding these clusters. In the following work, a carbon nanotube-polymer composite (CNP) was developed to expand T cells ex vivo (Figure 4). The CNP was made of carbon nanotubes with magnetite and PLG (polylactate-co-glycolate) nanoparticles loaded with IL-2. The release of IL-2 from the PLG nanoparticles facilitated antigen presentation to T cells and proliferative capacity of T cells. These CNPs could remarkably activate the T cells ex vivo. Meanwhile, the magnetic properties of the PLG nanoparticles allowed for separation of CNPs from the expanded T cells after activation ex vivo. After adoptively transferred into the tumor bearing mice, the expanded T cells induced a significant delay in tumor growth in a murine melanoma model and increased T cell infiltration in tumor sites. Lymphoid organs such as the thymus, spleen, and lymph nodes are essential for the immune response. Bioengineering artificial lymphoid tissues aims to use these organs for treatment of various diseases is an emerging field. Successfully bioengineered artificial lymphoid organs are able to mimic the natural organs by recruiting and organizing lymphocytes into such structures and ensuring their survival, interaction, activation and function. [18, 19, 39, 120, 121] Biomaterial-based three-dimensional (3D) scaffolds have been widely studied for engineering of lymphoid organs. Various scaffold materials, including natural proteins such as fibroin, spidroin, alginate and collagen, synthetic polymers including PLG (polylactate-co-glycolate), PLA (polylactate), and PGA (polyglycolate), and inorganic mesoporous silica rods have been applied for constructing scaffolds. A carbon nanotube-polymer composite for T-cell therapy. (A) Schematic of bundled CNTs as aAPCs to activate T cells. (B) SEM images of a CNP at low (top) and high (bottom) magnifications. Right: TEM images of PLGA nanoparticles (top) and CNT (bottom). (C) Expansion ability of OT-1 CD8+ T cells by CNTs aAPCs. (D) Level of IFN-γ release from CD8+ T cells after various treatment as indicated. Reprinted with permission from ref. . Copyright 2014 Nature Publishing Group. The artificial lymph nodes that imitate the structure of a lymph node organ have been developed. First, several in vitro models of lymph node were created. In one approach, the researchers developed a bioreactor that imitated human cell microenvironment and homeostasis of primary follicles. It was developed using macroporous matrix sheets with dendritic cells or a suspension of lymphocytes wherein the soluble factors and cells could communicate with each other. Both the T and B lymphocytes and dendritic cells formed clusters within the matrix, indicating their potential functionality. Additionally, this system represented some of the processes in a lymph node, for example, the migration and interaction of lymphocytes with dendritic cells. In another example, Matloubian et al. constructed an in vitro lymph node model to study the local inflammation in lymph nodes. The model consisted of a matrix populated with fibroblast reticular cells under the controlled flow of lymphatic fluid. It was found that lymph flow affected not only the expression of the chemokines but also the rate of cell division, indicating that increased lymph flow may act as an early inflammatory cue to enhance efficient immune response. Recently, Purwada et al. examined the ex vivo generation of artificial lymphoid follicles with active germinal center (GC) reactions. 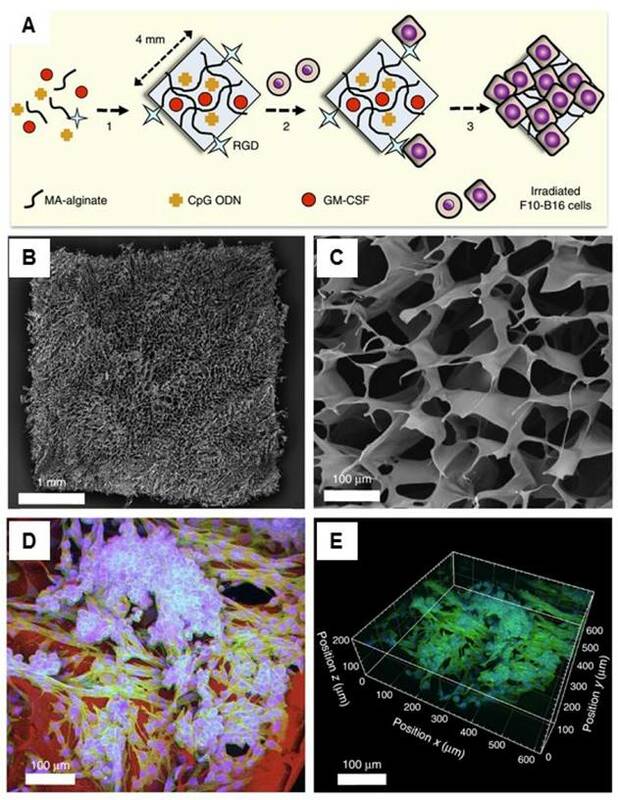 Here, the authors developed an artificial B cell follicle organoid made of a RGD-loaded hydrogel scaffold which reinforced with silicate nanoparticles (SiNP). The scaffold mimicked the anatomical microenvironment of a lymphoid tissue and could accelerate development and differentiation of primary naïve B cells into the GC phenotype ex vivo by providing extracellular matrix and signals to co-cultured naïve B cells. The described approach is promising for artificial production of antigen specific antibodies. Furthermore, in vivo models of artificial lymph nodes have been demonstrated. Irvine and co-workers designed injectable DCs-carrying alginate gels. An in vivo self-gelling formulation of alginate was designed, which was obtained by mixing calcium-loaded alginate microspheres with soluble alginate solution and dendritic cells. When subcutaneously injected into mice, these DCs' alginate 'nodes' attracted both host DCs and T cells to the injection sites over a week in vivo. Meanwhile, some of the inoculated DCs moved to the draining lymph nodes. This gel/DC system showed great promise in mimicking antigen specific lymph nodes to treat tumors or infections. Watanabe and co-authors[131, 132] developed a system based on a collagen matrix. The thymus-derived stromal cell line TEL-2 expressing lymphotoxin β receptor (LTbR) and vascular cell adhesion molecule-1 (VCAM-1) were embedded in 3D structure sponge-like collagenous scaffold (Figure 5). Murine lymphotoxin alpha (LTα) was also introduced into TEL-2 cells to establish a LTα-expressing TEL-2 cell line (TEL-2-LTα). The authors transplanted the collagenous scaffold with TEL-2-LTa cells and activated DCs to the renal subcapsular space of mice. It has been found that the transplants, which were infiltrated frequently, contained many T cell and B cell clusters. Moreover, these T cells and B cells had similar organization to that of the normal lymph node. They also demonstrated that several high endothelial venule (HEV) markers of secondary lymphoid organs and blood vessel-like structures were detected in the matrix, suggesting they had become organized tissues in mice. After transplantation of the matrix into BALB/c mice immunized with alum-precipitated NP-OVA, the mice displayed secretion of antigen-specific IgG antibodies in the transplants, indicating lymphocyte infiltration in the matrix organoids. Similar results were also demonstrated in immunodeficient (SCID) mice. Another therapeutic strategy is the implantation of cell-free systems saturated with immunomodulators to reprogram the specific lymphocytes. [33, 127, 133-138] For example, Mooney and coworkers designed a macroporous PLG matrix to present granulocyte macrophage colony-stimulating factor (GM-CSF), danger signals, and tumor antigens for the recruitment and activation of DCs, leading to significant anti-tumor immunity. Additionally, the same group also incorporated the cytokine GM-CSF, autologous tumor lysate, and Toll-like receptor 9 (TLR9) agonist CpG oligodeoxynucleotides (CpG ODN) into a porous PLG scaffold for the local recruitment and activation of DCs by subcutaneous implantation. Vaccination using this method induced both local and systemic CTL responses, leading to regression of established local and metastatic tumors. The enhanced efficacy of this vaccine could be a result of the promoted local activity of DCs induced by danger signals and antigens at the vaccination site. The same group recently reported cryogel-based whole-cell cancer vaccines for cancer immunotherapy. The authors similarly encapsulated GM-CSF and CpG ODN into sponge-like macroporous cryogels, which were formulated using alginate containing covalently conjugated Arg-Gly-Asp (RGD) peptides (Figure 6). These cryogels were then subcutaneously injected into mice, leading to significant anti-tumor T cell responses in a melanoma model. In addition, inorganic mesoporous silica rods (MSRs) with a high-aspect ratio were found to assemble in vivo after subcutaneous injection, forming macroporous structures. This macroporous structure could create a 3D cellular microenvironment which could recruit the host immune cells. The authors found that the MSR scaffolds could greatly increase the number of recruited cells compared to polymer scaffolds. High level of CD8+ T cells were found in the spleens of treated mice, indicating that the MSR-vaccine induced antigen-specific cellular responses. Other artificial lymphoid organs, such as an artificial thymus, are also highly attractive targets because they also play important roles in immune system. For example, thymus evolution with age results in a decreased output of naïve T lymphocytes, which contributes to weaker immunosurveillance in the elderly for various diseases, including cancer. Although in vivo models have yet been reported, artificial thymic organoids have been developed in vitro. 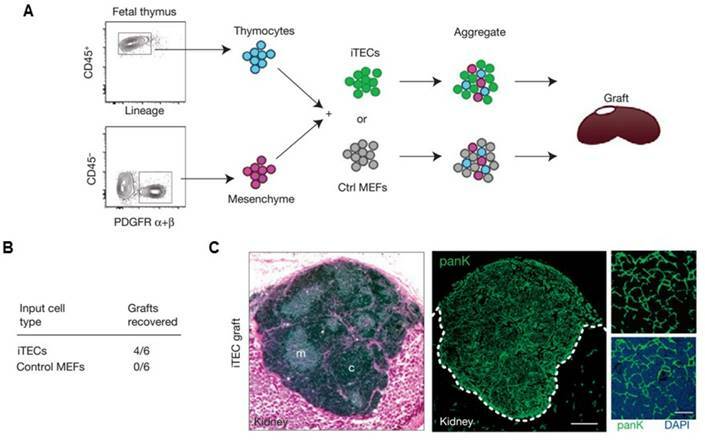 [140-142] In a recent study, Blackburn and co-workers described a system for producing thymic epithelial cells (TECs), a key cell type of the thymic stroma, by reprogramming mouse embryonic fibroblasts (MEF) that expressed Foxn1 in vitro. It has been found that with Foxn1 expression, MEFs acquired a normal TECs phenotype, characterized by surface markers (EpCAM) and genes for factors that are important for their functional activity (Dll4, CCL25). Co-cultivation of the Foxn1 transformed MEF and T cell progenitors led to the generation of a transient population of CD4+ CD8+ thymocytes, as well as terminally differentiated CD4+ and CD8+ T cells compared to the TECs isolated from embryonic mouse thymus. 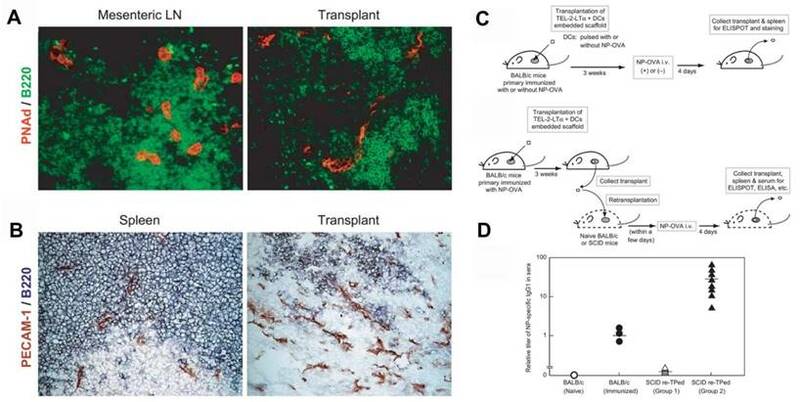 This work provides opportunity of applying thymus transplantation to boost immune function, which is an essential step towards bioengineering of an artificial thymus (Figure 7). The construction of an engineered spleen has been successfully realized in a mouse model. In this spleen transplantation technology, spleen units from neonatal rats were loaded onto a scaffold made of polyglycolic acid coated with collagen and then transplanted into the omentum. The transplanted spleen resulted in the formation of a normal splenic structure. In addition, immunological function of the implanted spleen was also demonstrated. Similarly, mucosal immune tissue has also been demonstrated through neointestine synthesis. In this technique, neonatal rat small bowel was seeded onto biodegradable polymer tubes made by polyglycolic acid fibers coated with collagen. These constructs were transplanted into syngeneic adult recipients. After 20 weeks, intraepithelial and lamina propria immunocyte were detected in transplanted intestines, suggesting their capacity to form a mucosal immune system. Generation of a synthetic lymphoid tissue-like organoid in mice. (A) Fluorescence imaging of transplant tissues. Red, PNAd (one of the HEV-specific adhesion molecules) and green, B220. (B) Immunohistochemical staining of spleen and transplant tissues. Red, PECAM-1 (adhesion molecule expressed on endothelial cells of blood vessel) and bluish purple, B220. (C) Schematic of the procedure to study formation of antigen-specific IgG1 antibody under various conditions. (D) Specific IgG1 antibody was detected by ELISA in sera from SCID mice after various treatment as indicated. Reprinted with permission from ref. . Copyright 2004 Nature Publishing Group. Injectable cryogel-based whole-cell cancer vaccines. (A) Schematic of an alginate-derived active vaccine formulation. (B-C) SEM imaging (B) and SEM cross-sectional image (C) of the alginate cryogel. (D-E) 2-D confocal micrograph (D) and 3-D reconstructed confocal fluorescence micrograph (E) of the alginate cryogel. Irradiated B16-F10 cells on a typical RGD-containing cryogel was showed in the picture. Reprinted with permission from ref. . Copyright 2015 Nature Publishing Group. As an interdisciplinary interface of cancer biology, immunology, bioengineering and materials science, the development of artificial immune cells and artificial lymphoid organs holds great promise in enhancing immunotherapy. It can overcome limitations of natural immune cells and lymphoid organs, creating desired therapy options for patients. For the bioengineering of aAPCs (Table 1), ex vivo use of these systems for T cell expansion and activation have showed advantages and effectiveness compared to the use of natural APCs, which have been often used in clinical applications for T cell transfer therapy. Such biomimetic particles can specifically encapsulate and release soluble small molecules and present biological proteins to trigger cell signaling of T cells. Further development of ex vivo used aAPCs optimized for clinical applications should be with improved flexibility and efficient antigen presentation. Although still limited by current knowledge, optimization directions include adjustment of surface ligands, cytokines, material size and shape, ligand mobility and orientation, and anisotropy. For example, the design of 3D-SLB particles could be made by coating natural cell membranes with ligands and signals, as lipid bilayers to PLGA particles would be a promising strategy to mimic the natural DCs. Furthermore, the incorporation of magnetic particles can be readily applied to separate particles and cells after expansion, improving the clinical efficiency for the T cells expanded ex vivo. The development of safe and biocompatible systems should be taken into consideration when used for the in vivo aAPC immunotherapy. Biodegradable polymer particles have often demonstrated excellent biocompatibility and are useful for the release of cytokines or other immunomodulatory factors. However, how to enhance their interaction with T cells in vivo should also be further studied. Additionally, developing nanosized particles[145, 146] that can accumulate in the lymph nodes and organs may boost the efficacy of in vivo aAPC therapy. Tumor heterogeneity is another major challenge when training T cells for ACT. [12, 147, 148] Treating a heterogeneous tumor with single antigen-specific T cells can lead to limited antitumor effects. Particularly, attention has shifted to neoantigens, which are an individual's tumor-specific mutations antigens that are new to the immune system and are not found in normal tissues. [12, 149] Further development of aAPCs that can elicit broad-spectrum and neoantigen-specific T cells for personalized cancer immunotherapies is one of the emerging trend in this field. Additionally, during the translation of these therapies to a clinical setting, the application of good manufacturing practices (GMP) of such biomaterials or biomimetic materials may present significant challenges. The concerns of compliance within GMP standardization and associated costs need to be addressed for further translation. Moreover, as the natural organs are complex, further thorough understanding of lymphoid organogenesis and molecular signaling is highly important. One strategy considers implantation of biomaterial-based cell-free scaffolds containing immunotherapy agents as a “node” for immunization, while the other strategy is more complex and looks to re-program or introduce cells into lymphoid organ structures, for long-term function as a lymphoid organ after implantation. However, it should be noted that while many approaches relying on gene-modified mouse cell lines are useful for basic research, they could not be applied to patients. These problems can be avoided by replacing the cells with patient-derived induced pluripotent stem cells (iPSC) as a source of stromal cells for generation of artificial lymphoid organs. [151, 152] Furthermore, the development of high-performance lymphoid organs is feasible by combining these two strategies together. Artificial thymus generated from FOXN1-reprogrammed fibroblasts. (A) Schematic of the procedure to show in vivo grafting assay. (B) Summary of recovered grafts after various treatment as indicated. (C) H&E staining (left), and pan-cytokeratin (right) staining of the iTEC-derived kidney graft, indicating that FOXN1-induced TECs (iTECs) established a complete, fully organized and functional thymus. Reprinted with permission from ref. Copyright 2014 Nature Publishing Group. Summary of representative aAPCs used for immunotherapy. This work was supported by grants from the Alfred P. Sloan Foundation (Sloan Research Fellowship) and the pilot grant from the UNC Cancer Center.